We can use mathematical models to simulate reaction behavior. This allows us to reduce the number of practical experiments to a minimum. We obtain valuable information about safety, scale-up, and stability. The most important application of kinetic methods in thermal analysis is to predict reaction behavior under conditions where measurements are difficult to perform or where the reaction times are very short or very long. In brief, this webinar discusses various kinetic methods and why they are so attractive. 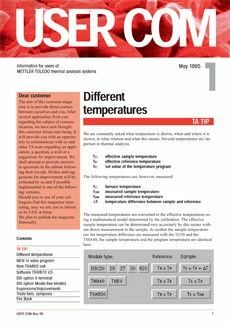 It begins with an overview of kinetics theory and shows you how we can obtain suitable experimental data from differential scanning calorimetry and thermogravimetric analysis. Finally, several applications that demonstrate how we can use the results to predict reaction behavior are presented. Some of the examples also illustrate how to check predictions. Welcome to this seminar on kinetics using thermal analysis techniques. Kinetics is a very useful method for investigating and predicting reaction rates and reaction behavior. The term kinetics includes chemical kinetics, reaction kinetics, or kinetic methods of analysis. In this seminar, I would like to discuss what kinetics is and why the method is so attractive. I then want to run through the theory and show you how we can obtain suitable experimental data from differential scanning calorimetry and thermogravimetric analysis. Finally, I will present several applications that demonstrate how we can use the results to predict reaction behavior. Some of the examples also illustrate how to check predictions. Slide 2: What is Kinetics? Kinetics is the study of the reaction rates of chemical processes. The aim of kinetics is to understand how different experimental conditions influence the rate of a chemical reaction, and possibly obtain information about the mechanism of the reaction and transition states. This knowledge allows us to develop theories and mathematical models that describe the characteristics of the chemical reaction in question. This then enables us to predict the rate of the reaction under other conditions. Slide 3: Why Do We Use Kinetics? Now, I have just said that kinetics tells us how fast a reaction proceeds. The simple example in the bottom right diagram shows the influence of temperature on the reaction time or conversion. Second, the conversion of a starting material into a final product can be treated as a global reaction that describes how fast the overall reaction occurs. Third, we can use mathematical models to simulate reaction behavior. This allows us to reduce the number of practical experiments to a minimum. We obtain valuable information about safety, scale-up, and stability. Finally, the knowledge we gain helps us to understand and study reaction mechanisms. - How long does it take to reach a certain conversion when the process tempe¬rature is too low? - How much heat is produced when the temperature is too high, and what is the run-away scenario in safety investigations? - How stable is the material in storage? Before we can answer these questions, we need suitable experimental data and appropriate mathematical models to perform calculations. I would now like to explain some of the basic principles. d alpha divided by d t is the reaction rate that shows how fast the conversion alpha changes with time. The influence of the conversion on the reaction rate is described by a function f alpha that I will come back to later on. The temperature dependence of the reaction rate is described by the well-known Arrhenius equation shown in the equation below. Here, the function k T is the tempera¬ture-dependent rate constant, and k zero is the pre-exponential factor. In the exponent of the equation, E a is the activation energy of the reaction, R the gas constant, and capital T the absolute temperature. In order to describe the reaction rate, we have to determine the individual terms, that is, the function f alpha , E a, and k zero . To do this, we need measurement data for the conversion alpha and for the rate d alpha divided by d t.
One method to obtain suitable data for kinetic evaluations is to use differential scanning calorimetry, DSC. The upper diagram displays the DSC heating curve of an epoxy resin. It shows a glass transition and a chemical reaction. The ordinate is milliwatts and the abscissa in degrees Celsius. As usual, the exothermic reaction is shown a peak in the upward direction. Integration of the peak area above the baseline yields the reaction enthalpy. In this case, this is the amount of heat produced when a sample of the unreacted epoxy resin is heated from 50 to 240 degrees. The complete crosslinking or curing reaction of the resin produces almost 136 joules per gram. This enthalpy is called delta H total. The conversion, alpha, measured by DSC is therefore 100 percent at 240 degrees. At 150 degrees, the resin is only partially crosslinked and alpha is less than 100 percent. The partial area is shown as the green hatched area and amounts to 24.2 J/g joules per gram. We can now easily determine alpha at 150 °C by dividing the partial area at 150 degrees by the total area. This yields a value of 17.8 percent for alpha . The conversion curve from zero to 100 percent shown in the diagram below was calculated for each measurement point in the same way. The reaction rate d alpha divided by d t corresponds directly to the normalized heat flow at the corresponding temperature as marked in the diagram by the red arrow. In summary, the DSC measurement shows us how fast the reaction proceeds and provides the data needed for the kine¬tic evaluation. We can also gain data in a similar way from thermogravimetric analysis, TGA. The weight versus temperature curve in the upper diagram shows the decomposition steps of calcium oxalate monohydrate. The complete decomposition yields a total weight loss of about 6 milligrams or 60 percent, which corresponds to 100 percent conversion. The first reaction step is completed by 200 degrees. The weight loss corresponds to a conversion of 19.7 percent and is due to loss of water of crystallization. Alpha is thus the weight loss, delta m , normalized with respect to the total weight loss delta m total for the observed reaction, as shown in the upper equation. The reaction rate is the derivative with respect to time of the weight loss curve, normalized with respect to the total weight loss delta m total as described in the lower equation. As we previously showed, the temperature dependence of a reaction is described by the Arrhenius equation as given in the upper equation. The logarithmic version of the equation is given below. The logarithm of k displayed as a function of the inverse temperature, 1 divided by T , shows a linear relationship. The slope of this straight line includes the activation energy, E a . Values of E a are of the order of 50 to 200 kilojoules per mole. The Arrhenius equation shows that the reaction is faster at higher temperatures. This is confirmed in the DSC measurements shown in the next slide. The slide shows DSC measurement curves of the isothermal curing of an epoxy resin at three different temperatures. The maximum of the exothermic reaction peak is higher at 160 degrees than at 120 degrees. This means that heat production at the maximum reaction rate is greater. Since the peak area and hence the reaction enthalpy is practically the same in all three cases, the reaction takes longer at lower temperatures. The isothermal DSC measurements portray how fast the reaction proceeds and how long it takes until it is completed. The shape of the peak also shows whether the reaction rate initially increases. If several reaction steps occur, we typically observe several peaks. The crosslinking reaction just discussed can also be measured dynamically. This is done by heating the unreacted sample in the DSC from a low temperature at which practically no reaction occurs to a high temperature at which conversion is complete, in this case 230 degrees. The three curves were measured at heating rates of 2, 5, and 10 degrees per minute. The reaction takes place at lower temperatures when lower heating rates are used. The area of the peaks appear different because the abscissa scale is in degrees and not in units of time. The reaction enthalpies are however about the same. This means that the same conversion and the same degree of crosslinking is achieved in each case. In practice, several dynamic measurements are normally used for kinetic evaluations. I will discuss this later on. Curve interpretation is easier because the baselines are horizontal. Less decomposition occurs because the isothermal temperatures are generally lower than the end temperatures in dynamic measurements. It easier to distinguish between complex and simple reactions from the shapes of the curves. On the negative side, isothermal measurements take longer, and with fast reactions, it is more difficult to define the start time. Dynamic measurements have the advantage of relatively short measurement times and the fact that usually 100 percent conversion is achieved. In thermal analysis, we generally use dynamic measurements to obtain the experimental data and isothermal measurements to check the predictions. Up until now, I haven’t said anything about the f alpha function, that is, how the reaction ¬rate depends on the conversion. The simplest model is the Wilhelmy equation, which is known as nth order kinetics. The equation describes the transformation of a starting material to the end product analogous to a decay reaction. The three kinetic parameters k zero , the activation energy E a , and the reaction order, n can be determined from a single dynamic measurement. The “Kinetics nth order” software package also includes other options such as the ASTM E698 standard test method for Arrhenius kinetic constants and the ASTM E1641 standard test method for decomposition kinetics by thermogravimetric analysis. 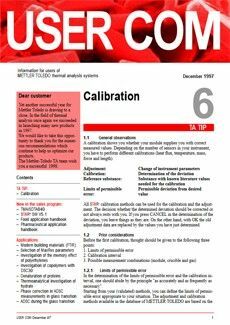 These methods use only a few measurement points and are therefore suitable for simple reactions. 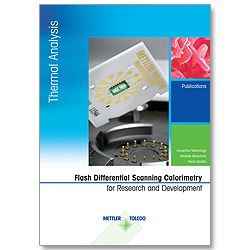 Thermal analysis is normally used to analyze solid-state reactions. These are more complex and the equation for the reaction rate must be adapted to take into account the sum of a number of different reactions as shown in the above equation. Many models for the conversion function have been developed and published in the literature as the short list of the f alpha functions show. If, in addition, different chemical reaction mechanisms are involved, a large number of chemical parameters have to be determined from the measurement data. It then becomes difficult to differentiate between individual models. The activation energy is always constant. The analyst must have a good knowledge and understanding of the theoretical principles to choose the right model. It is therefore much easier to use the so-called “Model Free Kinetics” approach in which no assumptions have to be made about the chemical or physical reaction models. The chemical changes are summarized in the global reaction and the activation energy usually changes with conversion. This slide shows a few fundamental approaches for the determination of the activation energy as a function of conversion. The calculations do not need any assumptions to be made about the f alpha models. As we can see in the equation on the right, the rate equation is integrated and the function g alpha determined. The rate constant, k , is determined from the Arrhenius equation and the time increment d t is replaced by the heating rate, beta. The mathematical calculation of the conversion-dependent activation energy E alpha assumes that the g alpha function is independent of the heating rate. 1. The model free approach of Vyazovkin uses the so-called isoconversion principle. This states that, at any particular conversion, the reaction rate depends only on the temperature, and is independent of the heating rate. This approach is also used by other kinetic methods. 2. In model free kinetics, as the name implies, we do not have to choose a particular reaction model. 3. The temperature dependence of the reaction rate is described by the Arrhenius equation. 4. Complex reactions show that the activation energy depends on the conversion. The resulting so-called “apparent activation energy” is the basis for further calculations to characterize the reaction, that is, in particular to predict reaction behavior. The next slide shows the individual steps involved in a kinetic evaluation. This slide summarizes the steps involved in the MFK evaluation procedure in one single diagram. The data originates from DSC measurements. In Step 1, we define the reaction peaks and draw baselines for the integration. In Step 2, we calculate the conversion curves by partial integration of the curves recorded at the four different heating rates. In Step 3, the conversion-dependent activation energy, E a , is calculated from the conversion curves using MFK. The diagram shows that E a changes during course of the reaction. This indicates that more than one mechanism is involved in the reaction. We refer to this activation energy as the “apparent activation energy”. The determination of E a is not the final goal of a model free kinetics evaluation. In Step 4, we use the data to make predictions, for example to predict the conversion curve as a function of time at isothermal temperatures of 60, 80 and 100 degrees. We can then for example read off how long it takes to reach a particular conversion value at a certain temperature, for example 95 percent conversion at 60 degrees. According to the table, the time is 58 min. The experimental data needed for the evaluation required a measurement time of about three and a half hours, plus just a few minutes for the evaluation. The method allows us to gain a very practical insight into the reaction behavior. I now want to discuss several applications in more detail. The main purpose of our kinetics software packages is to describe the kinetic characteristics of a reactive system and hence be able to predict reaction behavior as a function of time and temperature. Such predictions are particularly valuable if the reaction cannot be directly investigated in a practical experiment under the desired conditions. This is the case with fast processes in which the reaction lasts only a few seconds or conversely in applications where reactions are very slow, for example the storage of reactive systems at low temperatures. The question most frequently asked in the optimization of processes or in safety investigations is: How long does it take to reach a certain degree of conversion at a given temperature? First, it allows us to calculate conversion as a function of time. This is shown as a curve or as values in a table as shown in the upper right diagram. For example, the blue curve shows the curing reaction of an epoxy resin at 140 degrees. We can see from this that it takes three and a half minutes to reach 50 percent conversion. A second way to visualize the behavior is to calculate isoconversion curves or tables. This is shown in the upper left diagram. The green curve predicts that to obtain a degree of cure of 75 percent in three minutes requires a temperature of 153 degrees. Both predictions are based on the same kinetic parameters. They were obtained using an nth order evaluation of the DSC measurement curve shown in the lower part of the figure. The third possibility of applied kinetics is to simulate the measurement curve itself. The red simulated curve agrees well with the black measured DSC curve and indicates whether the three kinetic parameters, log k zero , E a , and reaction order, n , describe the measured conditions sufficiently well. This seems to be the case here. We now have to verify this, which brings me to the next slide. The diagram on the right shows three conversion curves for the isothermal curing of an epoxy resin at 60 degrees. The red curve is that predicted using the Model Free Kinetics program and the dashed curve is that predicted by nth Order Kinetics. The third curve in blue is the isothermal DSC measurement. It can be seen quite clearly that Model Free Kinetics yields a better prediction than the simpler nth Order Kinetics model. The path traced out on the left of the slide shows the individual steps of the kinetic evaluation and verification: After data collection, the next step is to perform a consistency test by comparing the curve shapes, reaction enthalpies and possible weight losses of several measurements. Finally, wherever possible, the calculated predictions should be verified in a further experiment using the same or a different technique. This slide presents an overview of possible applications of kinetic methods of analysis. The list shows that one of the main applications of kinetics is in process optimization involving crosslinking reactions in thermosets and elastomers. These materials are widely used, for example in the aerospace and automobile industry. Other major application areas of kinetics include the assessment of thermal stability, for example of pharmaceutically active drug substances, as well as safety investigations of chemical substances and highly energetic materials. Kinetic analyses are also performed for comparison purposes, for example to characterize the influence of stabilizers or catalysts. I will now illustrate this with the aid of several application examples. This application describes how kinetic analysis was used to test the thermal stability of a drug substance and estimate its storage stability. The decomposition curves were determined by thermogravimetric analysis. The DTG curves in the upper left diagram show the rate of weight loss at different heating rates. As I have already explained, the next step is to determine the conversion curves and then use Model Free Kinetics to calculate the activation energy curve as a function of conversion. The activation energy changes relatively markedly up to about 20 percent conversion. This indicates that several different factors influence the decomposition reaction. The isoconversion predictions are shown in the diagram on the right. This predicts that 2 percent decomposition would occur after 10’000 hours or roughly one year at a storage temperature of 26 degrees. Storage at 40 degrees for the same length of time would result in 3 percent decomposition. The results can then be verified using suitable long-term experiments. In safety investigations, information about whether a reaction exhibits autoacceleration behavior is of great importance besides the actual decomposition potential of the material. Ethyl acrylate quickly polymerizes without a stabilizer. The reaction is strongly exothermic and can lead to an explosion under adiabatic conditions. The DSC curves in the upper left diagram show the behavior of the substance on heating. Model Free Kinetics was used to calculate the activation energy curve and predict the isothermal reaction curves at different temperatures. For example, at 110 degrees no reaction is observed until the inhibitor is completely used up after about 5 hours, whereupon the material suddenly polymerizes. The activation energy curve shows a low value that gradually increases. The predicted curve was verified by performing a suitable measurement. The resulting red dashed measured curve and the blue predicted curve show good agreement. MFK is very useful for assessing the performance of adhesives. Here, it is important to know how long a connection must be held in place until it supports itself. Cold-setting adhesives are catalyzed systems that must set firmly at low temperatures within a short time. The example shows three DSC measurements of the exothermic curing process of an adhesive. The samples were measured between minus 20 and plus 50 degrees at different heating rates and different isothermal end temperatures. Reaction curves were then predicted for different temperatures using MFK. These are shown in the diagram on the right. Most epoxy-based adhesives are already hard at 80 percent conversion. The time to reach this value at a room temperature of 25 degrees is 7.5 minutes. This was confirmed by the corresponding isothermal measurement shown as the red dashed curve. 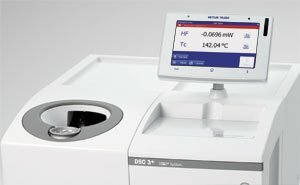 Decomposition rates are best studied by thermogravimetric analysis. The example shows kinetic measurements performed on ammonium perchlorate. This substance is used as an oxygen donor in solid rocket propellants. The bottom left diagram shows the temperature programs M1 to M4. The temperature was ramped from 220 °C to different end temperatures at different heating rates. The end temperature was then held constant until the decomposition reaction was completed. This is apparent through the practically complete loss of weight. Model Free Kinetics was then used to calculate the activation energy. This information can now be used to calculate a simulated dynamic TGA curve shown as the red dashed curve in the top right diagram. The decomposition process clearly occurs in two steps with a weight loss of about 25 percent in the first step. This two-step behavior is also apparent in the activation energy curve. The simulated TGA curve can now be compared directly with the black curve measured at the same heating rate. The simulated curve agrees well with the measured curve considering the complexity of the reaction. The differences in the second step could be due to small experimental differences such as sample mass, packing density or gas flow. I am sure you are all familiar with cooking hard or soft-boiled eggs. The reaction is in fact complex and involves the denaturation of different protein fractions in the egg white. The process can be measured by DSC as the three curves in the upper left diagram show. The complexity of the denaturation is apparent from the fact that the curves exhibit several endothermic peaks. These are shifted to higher temperatures at higher heating rates, which is the case with all kinetic effects. The large changes in the activation energy curve also indicates that the denaturation process is complex. The isoconversion curves shown in the right diagram were calculated using the applied kinetics program. They show, for example, that the egg white is denaturated to 90 percent after ten minutes at 80 degrees, which means that the egg is practically hard boiled. In contrast, after just three minutes at the same temperature, the conversion is about 60 percent and the egg is probably still soft. Let me now summarize the main points of my talk. The nth order kinetics package is based on a very simple model and as a result has rather limited application possibilities. The software package also includes evaluation procedures described in ASTM standards. The Model Free Kinetics package does not require a chemical-physical model and describes complex reaction behavior very well. The kinetic calculations are based on three or more dynamically measured conversion curves. The mathematical result is a conversion-dependent activation energy. The Advanced Model Free Kinetics package extends the possibilities of MFK in that it can use any dynamic or isothermal temperature program or a combination of the two. The Advanced Model Free Kinetics program also includes advanced mathematical procedures. The main application of kinetic evaluations is to predict reaction behavior at other temperatures and times. This enables the scientist and engineer to optimize processes, predict optimum reaction temperatures, assess storage capabilities, and estimate the thermal stability and lifetimes of materials. Predictions should be checked wherever possible using practical experiments. Finally, I would like to draw your attention to information that you can download from METTLER TOLEDO Internet pages. An entire set of specific UserCom articles is available. 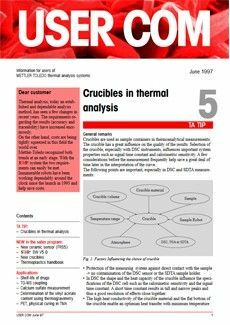 We publish articles on thermal analysis and applications from different fields twice a year in our well-known UserCom customer magazine. This now concludes my presentation on kinetics. Thank you very much for your interest and attention.